After that memorable tasting on friday evening we didn’t take much of a break on saturday and went on with a few more bottles. This time we also seized the opportunity for exploring the Jura wine world and with our local hero Didier we probably had the best guide one could get. He calls this region his home and is a great ambassador for the local wines which, as you might know, are packed with character and are probably the opposites of mainstream stereotypes. In Château-Chalon itself, after a 2 minutes walk from our holiday home, we already arrived at Domaine Mâcle which holds a very good reputation. 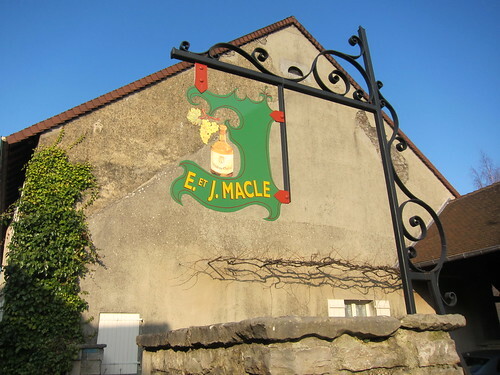 We had the opportunity to try their restraint offering comprising the current releases of their Côtes de Jura and Château-Chalon AOC whites, as well as their Macvin du Jura. For those of you who might not be aware of the typical style of the region: the wines are for a big part oxidized, coming quite close to Spanish Sherry. The most prominent category is called Vin Jaune and, among others, is famously represented by the Château Chalon appelation. It is a white wine that, after harvest and fermentation, is maturing 6 years and 3 months in a barrel under a veil of yeast and develops very intense walnut-like aromatics and oxidative notes. Once bottled, these wines are nearly indestrucible and can age for more than 100 years. 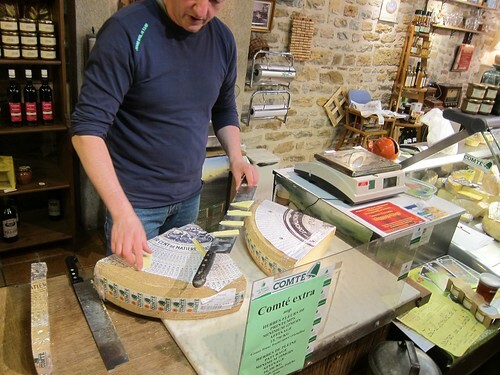 Typically, they’re the perfect accompaniment to the famous local cheese, the Comté. 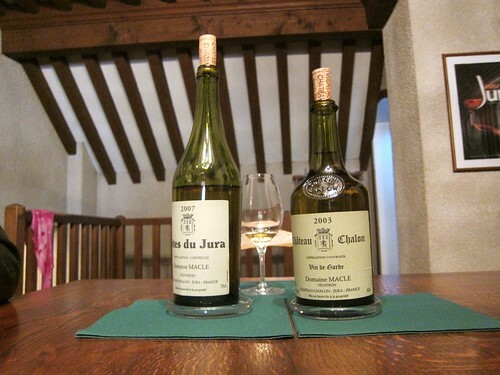 The currently released vintage of Vin Jaune in the Jura is the 2004. At Domaine Mâcle however, the 2004 wasn’t labeled yet and thus we were served the 2003. Although having the typical touch and weight, we found it to be less intense and complex than the 2002 we had a few months ago when Didier kindly popped a bottle in Germany. Could this be linked to the incredible heatwave we had all over Europe in 2003? But beforehand we also tried their 2007 Côtes du Jura, which unlike their Vin Jaune isn’t only made from Savagnin, but also with the Chardonnay grape. While Côtes du Jura is also made in an oxidative style, is released much earlier and appears somewhat fresher and juicier than the Vin Jaune. 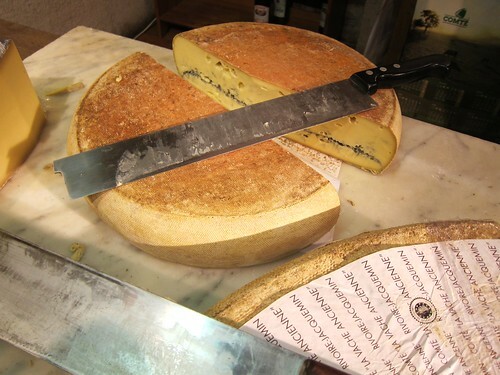 It can also age a few decades and is a bit more flexible when it comes to food pairing. But there are also the red Jura wines. These are of course not oxidized, but like their white counterparts they are wines full of personality. While Pinot Noir also plays a role in Jura, Poulsard and Trousseau are the names of the indigenous red grapes. These wines are often lighter in colour and offer juicy and bright fruit flavour next to somewhat rustic grainy tannins in their youth. They could be qualified as thirst-reds but are also perfect companions for food, and not only local specialties this time. 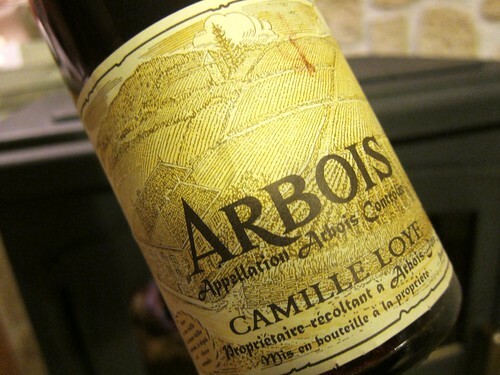 The best do have a good ageing potential and show surprising finesse in fruit after some years. 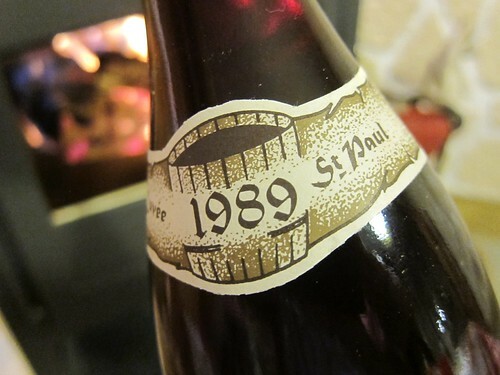 And thanks to Didier we had the opportunity to pop a 1989 Trousseau from Arbois by winemaker Camille Loye who is ending his business and selling all his wines at the moment. And it truly was a fascinating encounter. 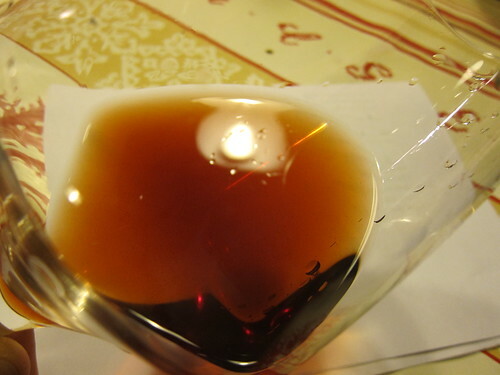 Incredible robe for this 22 year old wine and I especially mean this extreme transparency with a certain blurriness and not particularly the brownish-red colour. In the nose you catch the most elegant and subtle Fraise des bois smell mixed with a forest floor and mushroom touch which you sometimes get in aged Pinots. On the palate the fruit was there as well with all its finesse, and some nice acidity gave the wine structure and added lots of freshness. This was very drinkable. And again I have to use the French adjective gouléyant meaning that rather big gulps than small sips were induced. We had a couple more sips of Jura wine. At Stéphane Tissot’s tasting room in Arbois we tried the most extraordinary non oxidized Chardonnay, a 2008 Les Graviers which is strictly made from grapes grown at this lieu-dit “Les Graviers” and thus a genuine Terroir wine. Its strangely perfumed nose and mineral palate blew me off my socks and I felt compelled to buy 2 bottles. After that we had to start thinking about dinner preparations. In the end, all these wines need some appropriate food to deal with. In Arbois we thus stopped at a small butcher shop and grabbed a nice yellow Poulet des Landes. 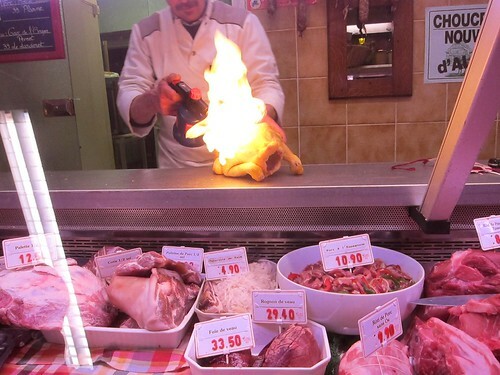 The quite funny bloke who was the butcher mastered the art of prepping a volaille so that it was nearly oven-ready! Back home we gave this beast a last touch and pushed it into the oven. While waiting for it to be done, a refresher was necessary. This time we opted fot the Loire with this light and vitalizing Chenin Blanc sparkler by Lise & Bertrand Jousset. Wow, I’m in love with Bubulle. It’s actually a quite simple Chenin Blanc sparkler, but with such appealing aspects, that it appears irresistible. Its nose is of fresh and intense yeast notes as well as of freshly cut sweet pears, maybe something brioche-like as well, but it is foremost that fruity yeast freshness that makes me wanna jump head first into that glass. In the mouth it’s the same show: yeast, pear, brioche: all that paired with a truly chalky minerality. The sparkler might have a little residual sugar, but what makes it so fascinating is the coherence of all elements, making it balanced and very linear. I promise you, this empties itself on its own. And if some might go for a run with gatorade, I’d rather bring that Bubulle along. Well I exagerate, but as an aperitif, or after a long day of work, this will put a smile on your face. I’m bullish on Bubulle! 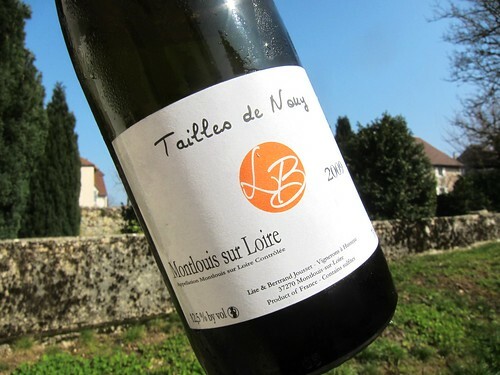 From the same producer, this Chenin Blanc still wine named Tailles de Nouy is also of great interest. 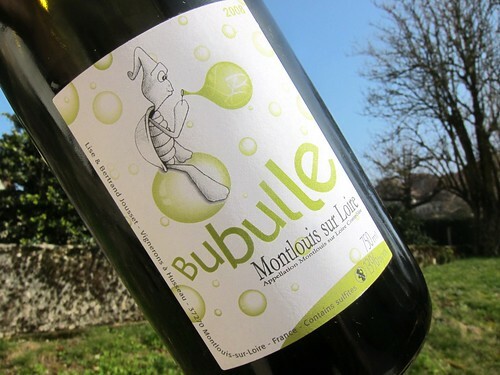 It is as well on the fruit-appeal side, with even a tad more residual sugar than Bubulle. But the authenticity of the fruit is just mind boggling. A lot of citrus-fruit flavours are having a conference on your palate, there’s a honey touch as well. Yeast notes seem to be a regular in this estate’s wines anyway, and a touch of minerality gives a little zing to the whole mix. That’s it! I Finally managed to report about most of the wines we had tried during this incredible weekend. And while we had a lot of non-local wines, I clearly feel I have made another step in my Jura wine education. Consequently, I guess I’m quite hip now since Jura is one of the next big things in the wine world. Just check the wine list of Momofuku Má Pêche, one of the most en vogue restaurants of New York and see for yourself how Jura-mania is becoming reality! (and “11 post”, yet again). 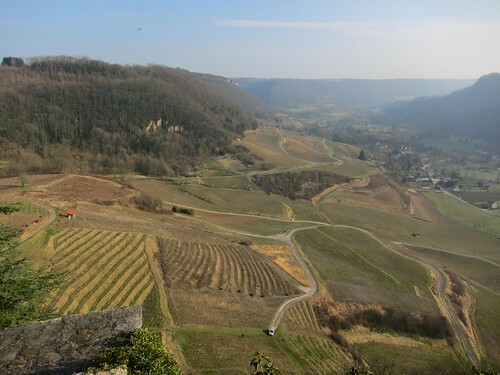 It sounds you had lots of fun in the Jura; it is one of those parts of the wine world I am not too familiar with, but get more and more interested in – so I will make a note of recommended producers etc. for further exploration!